It could all be our fault of course: perhaps we're just conditioned from watching too much run-of-the-mill drama. We like our explosions big and our plots hackneyed. So where was the dawn siege, the helicopter, the police hunt, the rousing music, the screaming parents portrayed by actors acting with a BAFTA in mind, running through police cordons in a frenzy? In fact, it's admirable writer Tony Grisoni was trying for something different, producing something that could be described as a bleak, even slow, close-up character study of the effects of grief - one that isn't simple, or doesn't have a happy ending. But in doing so it sometimes felt harder to care, especially when the camera would keep us away (sometimes it would be stuck looking through a car windscreen as the scene unfolded ahead) - why have us distanced from the drama? Elsewhere, at times a shout of OH GET ON WITH IT WILL YOU felt required, while at other times plot points felt missed out. Kaya Scodelario as Anna Salter in Southcliffe. 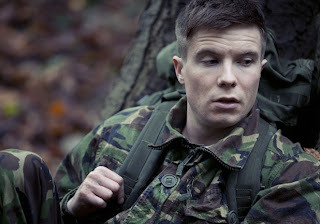 The young solider, Chris, disappeared from episode three; the suicide of the cheating husband who lost his wife and kids was not followed up; there was some sort 'childhood bullying' back-story referred to between the killer and the journalist but never apparently explored fully; and episode four jumped the story forward by a year with some of the characters no further on. So was it well-acted and thought-provokingly intelligent storytelling making the viewer work a little bit harder, watching lives unravel without order or neatness as they might well do in the aftermath of such a horrific event? Or was it more of a grim and frustrating wallow among the grief-stricken, watching them trying to cope with the unthinkable, that as a story occasionally lost its way a bit in a sort of art-imitating-life style statement that we're just not clever enough to understand?